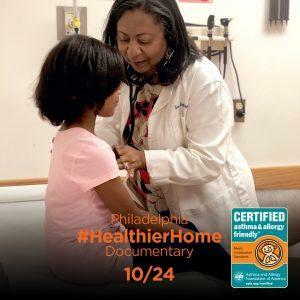 Press Release published by the Asthma and Allergy Foundation of America (AAFA) about the healthier home initiative that took place in Philadelphia in partnership with the Children’s Hospital of Philadelphia. The objective was to help 30 families in the region improve their indoor environment. A short-film documentary about the Healthier Home Initiative will debut at The Allergy Summit on October 24, 2018 in New York City, though the trailer can now be viewed here.